In the hit film Jurassic Park, one of the most iconic scenes is where a gigantic t-rex attacks two tour cars. The two tour cars featured in this scene are car #04 and #05. At Universal’s Islands Of Adventure, tour car #05 is on display! Car #05 is on the right side in the photo below, under the dinosaurs mouth. 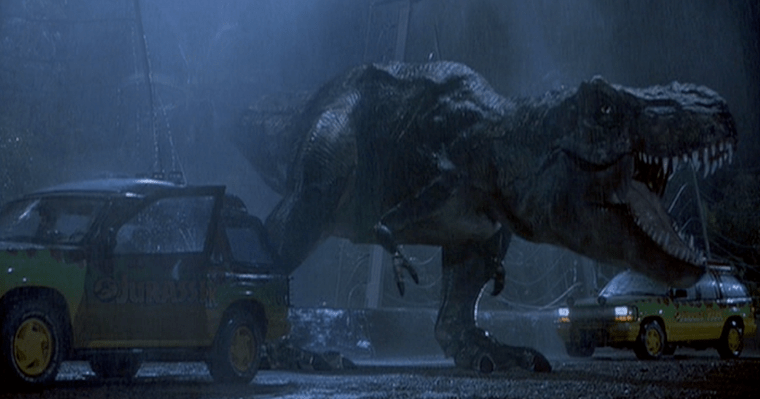 In the movie scene, car #04 was destroyed by the Tyrannosaurus-Rex, and car #05 survived. As seen in the video below, car #04 was the car with the kids in it, car #05 had Dr. Malcom and Dr. Grant in it. You’ll notice that tour car #05 is left to spare, in the next video you can see that car #04 is destroyed, but #05 isn’t touched. 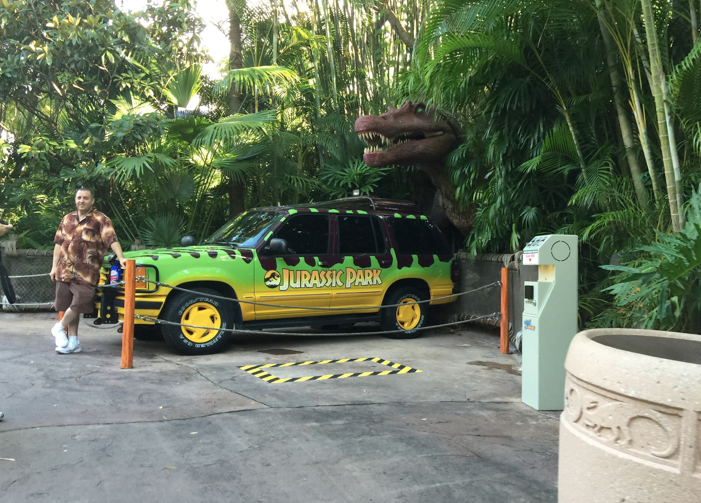 At Islands Of Adventure, the car is on display near the Jurassic Park Discovery Center. A model of a Spinosaurus is standing behind it. The Spino was the main dinosaur featured in Jurassic Park 3. You’ll notice that over the years parts of the car have changed, the #05 is no longer on the side of the car, and 2 of the spotlights have fallen off of the roof. The car has seen better days, but it is still in pretty good shape considering that it sits in the sun 365 days a year!